If you were to think any of the three, perhaps you would be right to an extent. This past weekend I’ve been recipe testing for multiple recipes ( sometimes 2-3 at a time) because I just don’t know how many weekends I will have coming up that I am able to do so. As you can imagine, my mind is pretty saturated right now with kitchen conversions like how many grams in 1 cup of cashews or how many tablespoons are in a 9 ounces of water or just that I ran out of cashews and used up my last lemon, which i needed for the picture, so now I must frantically run to the store to pick these up when I do not even know if I will need it in my recipe. As a disclaimer, I’ve also been listening to Anthony Bourdain’s audiobook, Kitchen Confidential, so I might have a run-on sentence or two and I might seem a little extra saucy, because that’s how he wrote. 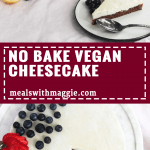 Back to this recipe, which I call my No Bake Vegan Cheesecake. Listen guys, it’s the summertime. No one wants to spend hours slaving away in the kitchen or turn on the stove. 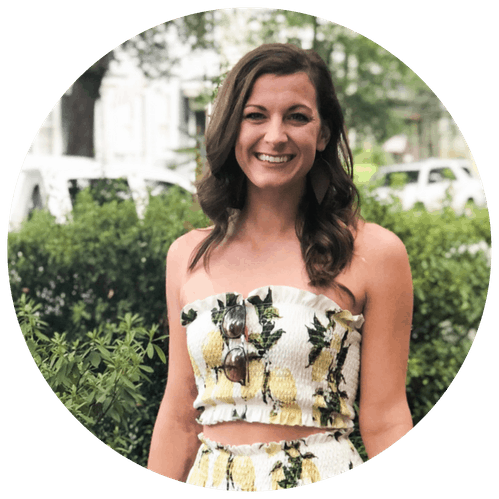 This recipe is perfect for those nights when you have a party to go to or just feel like eating something cold and sweet for dessert. I get it and I’M HERE FOR YOU. 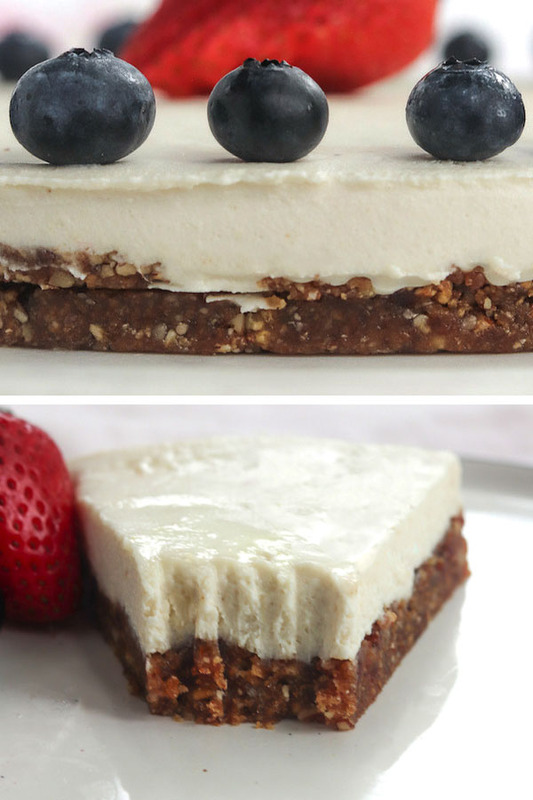 This No Bake Vegan Cheesecake is lower in sugar compared to the box kind and can be assembled in under 30 minutes. It does require a blender/food processor, but try not to complain while you lug it out of storage – it’s worth it, trust me. The combination of all of them creates that creamy, cold and soft texture that we love about cheesecake. 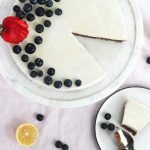 It’s a refreshing summer treat that is rich in healthy fats with a little dose of protein, ~4g per slice. 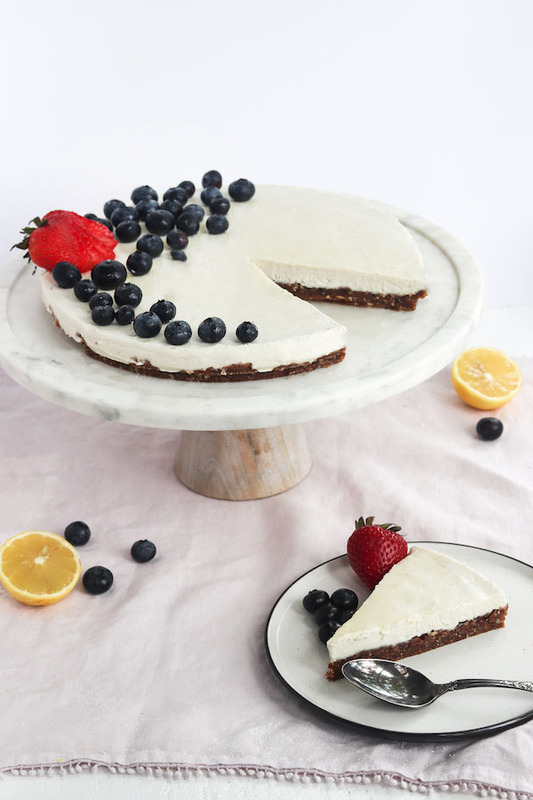 This No Bake Vegan Cheesecake is filling! I would recommend pre-slicing it. It serves 16. It can be stored in the fridge after initial freeze. P.S- I had very little knowledge of Anthony Bourdain prior to his death (sad, but true). So I downloaded his book and as I started listening, I could really see why everyone loved him. He was such an amazing writer, realist, adventurer and culinary rock star. I’m eager to read more of his books and catch re-runs of his show, Parts Unknown on TV. He will be missed. Soak cashew the night before or with hot water in a bowl while you assemble the crust. To make the crust, place dates and pecans in a food processor and process until crumbly and soft. Add in salt and graham crackers, pulse until it is sticky between your fingers. If its not sticky enough, add in more dates or a bit of water. If too wet, add in more graham cracker. Once crust is processed to desired consistency, press it into the bottom of a springform pan and chill for at least 20 minutes. 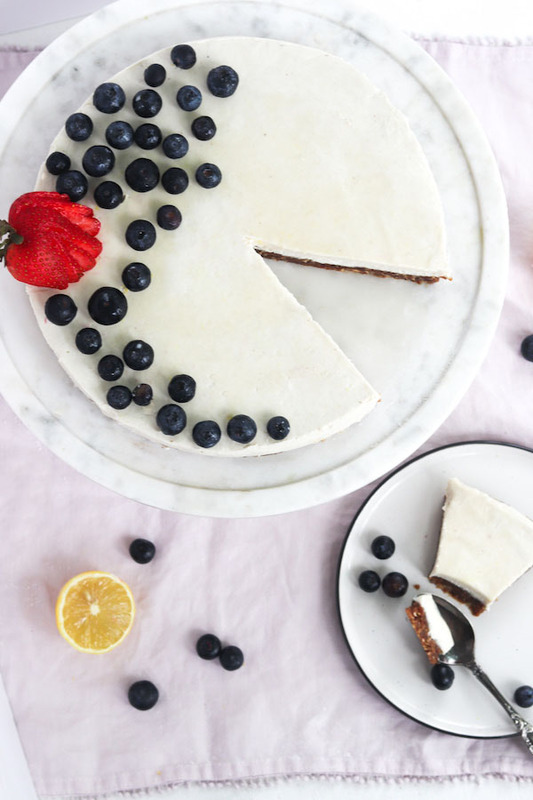 Using a blender, place all the ingredients for your cheesecake filling inside and blend until smooth and no lumps appear. Remove springform pan from freezer and pour blended cheesecake filling into the pan. Let it freeze for at least 4 hours to harden. Add whatever jam/fruit/chocolate/ you want for topping! It is recommended to remove the cheesecake from the freezer 5-10 minutes prior to serving. 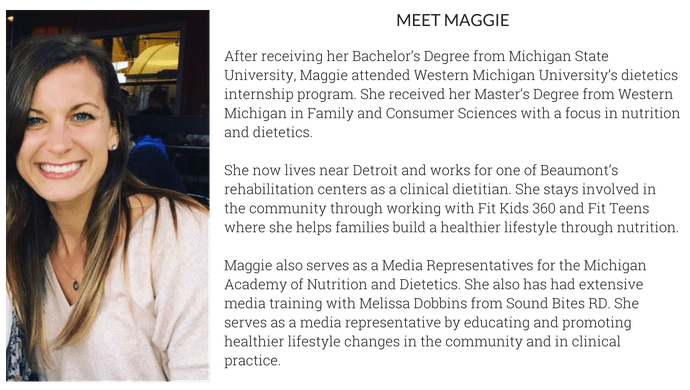 Don't forget to 'Pin it' and follow Meals with Maggie on Pinterest! This page may contain affiliate links, meaning I do make a small profit from your purchases. Your price is not affected by this commission. To see more affiliate links continue to my shop page.